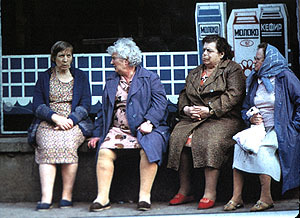 Image of Russian women who have experienced the ups and downs of Russian history in the twentieth century. I have read the information about submitting assignments in the course. I have read and understand the ELI policies and procedures. I have read and understand the course policy on plagiarism. Also, please include a statement about yourself that will help me distinguish you from other students in the course. The Introduction should be sent to your course instructor following the directions for submitting assignments. Please take a moment to review Charlie's History Writing Center for specific information on the writing requirements for the assignments in the course.